Sorry, but Ghost Town to Havana is either started or over at CCA: Centre For Contemporary Arts - Glasgow. From Ghost Town to Havana is an inspirational documentary directed by US screenwriter and Oscar nominee Eugene Corr. A lively street level story of mentor-ship and ordinary, everyday heroism in tough circumstances. 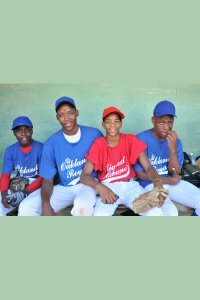 An inner city coach's son, estranged in his youth from his father, spends five years on ball fields in inner city Oakland and Havana, following the lives of two extraordinary youth baseball coaches. Nicolas Reyes, a 61 year old Afro-Cuban who and Roscoe Bryant, a 46 year old African-American man who coaches in a troubled Oakland neighbourhood wracked by three decades of gang violence.